Last week we introduced the all-new, API-driven Admin User Interface for Wazo 17.07. But pretty pictures are only the icing on the cake. It’s what’s under the hood that really matters. 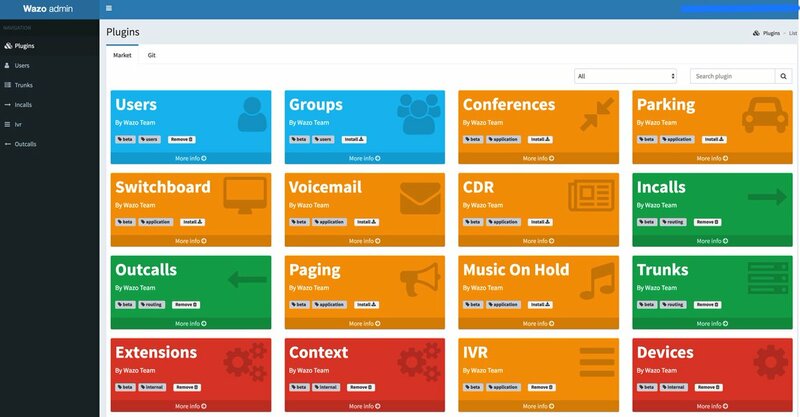 And today we want to walk you through the new IVR User Interface with Incredible PBX for Wazo. The Wazo developers heard from many of you that were missing the GUI-driven IVR tools available in other products. And we’re pleased to tell you it’s another Home Run for Wazo. The UI is well-documented, easy to use, and incredibly simple to implement. We should mention that our focus today is on the mechanics of using the new Wazo IVR Builder. We won’t be covering how to design a good IVR. If you want some great examples of poor IVR design, look no further than the main number of your favorite cellular or cable provider. Insofar as good design tips go, you can’t do better than learning from the master, Allison Smith. Here’s a link to her previous articles on Nerd Vittles. We’re assuming you followed last week’s tutorial and added the basic components for the Admin user interface after using your browser to login to https://IPaddress/admin/. If not, start there and install the following plugins to begin: Users, Extensions, Contexts, and Devices. Next, add the plugins for Incalls, Outcalls, Trunks, and IVR. The whole setup procedure takes less than a minute. When you’re finished, your Navigation Sidebar should look like what’s shown above. You’re obviously going to need a SIP or Google Voice trunk to handle incoming IVR calls so start there if you haven’t already set up at least one trunk that can be dedicated to your IVR. For the time being, add an Inbound Route for the Trunk that points to an extension. Now we’re ready to create your first IVR using the new IVR template in the Admin UI. Using your web browser, log back in to https://IPaddress/admin/ and (1) click IVR in the Navigation bar. Then (2) click + Add to create a new IVR. 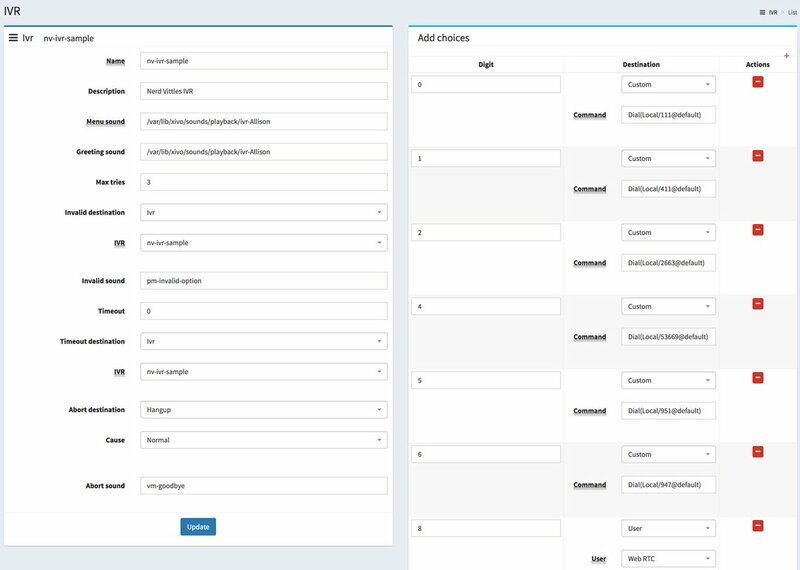 Since the pieces already are in place for the hard-coded Demo IVR that comes with Incredible PBX for Wazo, let’s use those components to demonstrate how easy it is to build your own IVR with the new GUI. As you can see from the completed form below, there are two main sections in setting up an IVR. There are some basic settings that handle answering the call, playing the welcome message, and managing error conditions. Then there are IVR options that correspond to the Digit pressed by the caller using a touchtone phone. Each of these options has a destination. Currently, the available options include playing a sound file, ringing an extension, running custom dialplan code, or hanging up a call. There also is the ability to nest IVRs. Once you have built the secondary IVRs, the options list will also include an IVR option. Since our sample IVR uses custom contexts for each of the Incredible PBX applications, we’ll rely heavily on the Custom option to route calls to extensions that were created when these applications were installed: Call by Name (411), Join Conference (2663), Lenny (53669), Yahoo News (951), and Weather Forecasts by ZIP Code (947). We’ll also show you how to direct a call to an extension using the default WebRTC extension (701). To get things going, simply copy the entries shown below and then Save/Update the template. The Wazo syntax to call a Custom destination looks like this: Dial(Local/951@default). Before you attempt to build your own IVR, keep in mind that you’ll need at least a greeting message that tells callers which buttons to press. This file should be placed in /var/lib/xivo/sounds/playback. You can also use any of the default sound recordings found in /usr/share/asterisk/sounds/en for error messages and retry alerts. You’re good to go now. Call your DID from another phone and try out your first custom IVR.